With the experienced eye of a scientist, Alexander Fleming turned what appeared to be a spoiled experiment into the discovery of the first of the "wonder drugs," penicillin. Fleming was born on August 6, 1881, to a farming family in Lochfield, Scotland. Following school, he worked as a shipping clerk in London and enlisted in the London Scottish Regiment. In 1901, he began his medical career, entering St. Mary's Hospital Medical School, where he was a prizewinning student. After graduation in 1906, he began working at that institution with Sir Almroth Edward Wright, a pathologist. From the start, Fleming was innovative and became one of the first to use Paul Ehrlich's arsenical compound, Salvarsan, to treat syphilis in Great Britain. Wright and Fleming joined the Royal Army Medical Corps during World War I. They studied wounds and infection-causing bacteria at a hospital in Boulogne, France. At that time, antiseptics were used to treat bacterial infections, but Wright and Fleming showed that, especially in deep wounds, bacteria survive treatment by antiseptics while the protective white blood cells in the wound are destroyed. This creates an even worse situation in which infection can spread rapidly. Forever affected by the suffering he saw during the war, Fleming decided to focus his efforts on the search for safe antibacterial substances. He studied the antibacterial power of the body's own leukocytes contained in pus. In 1921, he discovered that a sample of his own nasal mucus destroyed bacteria in a petri dish. He isolated the compound responsible for the antibacterial action, which he called lysozyme, in saliva, blood, tears, pus, milk, and egg whites. Fleming made his greatest discovery in 1928. While he was growing cultures of bacteria in petri dishes for experiments, he accidentally left certain dishes uncovered for several days. Fleming found a mold growing in the dishes and began to discard them, when he noticed, to his astonishment, that bacteria near the molds were being destroyed. He preserved the mold--a strain of Penicillium--and made a culture of it in a test tube for further investigation. 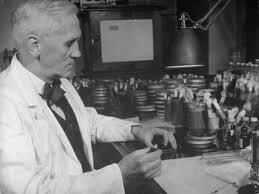 He deduced an anti-bacterial compound was being produced by the mold, and named it penicillin. Through further study, Fleming found that penicillin was nontoxic in laboratory animals. He described his findings in research journals but was unable to purify and concentrate the substance. Little did he realize that the substance produced by his mold would save millions of lives during the twentieth century. Fleming dropped his investigation of penicillin and his discovery remained unnoticed until 1940. It was then that Oxford University-based bacteriologists Howard Florey and Ernst Chain stumbled upon a paper by Fleming while researching antibacterial agents. They had better fortune than Fleming, for they were able to purify penicillin and test it on humans with outstanding results. During World War II, the drug was rushed into mass-production in England and the United States and saved thousands of injured soldiers from infections that would otherwise have been fatal. Accolades began pouring in for Fleming. He was elected to fellowship in the Royal Society in 1943, knighted in 1944, and shared the Nobel Prize in Physiology or Medicine with Florey and Chain in 1945. Fleming continued working at St. Mary's Hospital until 1948, when he moved to the Wright-Fleming Institute. He died in London on March 11, 1955.